Comments: Really pleased with this image. Used 15 min subs with a 7nm Baader filter which have seemed to do a really good job isolating the nebula from background sky. 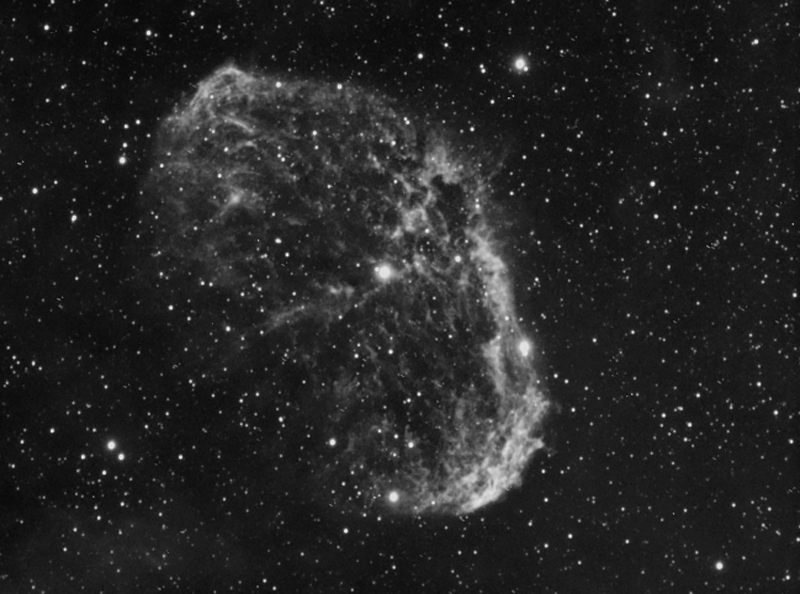 The Crescent Nebula (also known as NGC 6888, Caldwell 27, Sharpless 105) is an emission nebula in the constellation Cygnus, about 5000 light years away. It is formed by the fast stellar wind from the Wolf-Rayet star WR 136 (HD 192163) colliding with and energizing the slower moving wind ejected by the star when it became a red giant around 400,000 years ago. The result of the collision is a shell and two shock waves, one moving outward and one moving inward. The inward moving shock wave heats the stellar wind to X-ray-emitting temperatures.